If you are an old dirt farmer like me, you pumped countless hours into the Command & Conquer games. Series creator Louis Castle remembers and wants to bring that experience to a more mobile platform. Entitled War Commander: Rogue Assault, the game takes the usual free-to-play trappings and changes them up, bringing direct unit control, instant build, fully-3D environments, and two full campaigns at launch. If you’ve got a tablet, you need this game. GT: Tell us a little bit about War Commander: Rogue Assault. Louis Castle: War Commander: Rogue Assault is a MMO Mobile Real Time Strategy Game. You take command of individual squads of units and conquer enemy bases to capture resources that you then use to develop your own base an units. With your collected resources you can instantly improve your base defenses or your weapons technology. With improved technology you earn the ability to build or improve ever more powerful and tactically unique units that allow you to conquer even harder bases for greater rewards. The massively multiplayer world map allows you to form alliances and accomplish even greater conquests with other commanders in real time. Building your base is fun because it’s not tedious. GT: So the most obvious question is “Why a free-to-play mobile game?” when your background is so heavily rooted in PC RTS. Louis Castle: I love free-to-play games on mobile since they reach a far larger audience than pay before you play models on dedicated game machine platforms. My personal appreciation for mass-market games began while I was at Electronic Arts working with Steven Spielberg on Boom Blox for the Wii and evolved as I worked on web streamed games at IAC and social games at Zynga. I’m excited to be bringing some of the great game mechanics I have enjoyed playing over the past 30 years to the relatively new market of mobile strategy games. No bullshots here — the game does look this good. GT: The game looks absolutely stunning — what engine is War Commander: Rogue Assault built on? Louis Castle: Kixeye built War Commander Rogue Assault on Unity 5. There is a large amount of custom technologies and tools that have been created to allow our very talented artists to create some beautiful units and game maps. Over the past few years we have been able to continue improving the visuals of the game as Unity improved its tools and features. The game looks even better on a tablet. GT: Other than the setting, what differentiates you from your contemporaries like Clash of Clans and the like? Louis Castle: In addition to 2 full single player campaigns, War Commander: Rogue Assault allows players much greater control of units, the ability to build out their base instantly, and offers a massive multiplayer world map meta-game which is much more robust than the typical placement maps found in most games of this genre. Players individually control squads of units throughout the entire battle. This affords players many more choices of strategy and tactics in the game while remaining very easy to play. Once resources have been collected, players can build instantly without waiting for timers to expire. The massively multiplayer world map allows players to move their base and place Forward Operating Bases (FOBs) to influence the battles with artillery, reinforcements or tactical FOBs that alter individual and alliance game play at a meta level. Explosions look great. It’s awesome once you can unleash air power. GT: Can other players destroy your base in PVP? Does it cost resources to repair? What’s to stop players from reducing your base to ash every day? Louis Castle: When you return to your destroyed base from a battle or from being offline your base is quickly repaired and rebuilt so all you have lost is some relatively small amount of resources. Each attack puts you back at the end of a queue so you are not relentlessly attacked. However, other players will attempt to destroy your base to take your resources; that’s part of the fun. The best players find a good balance of investing in offensive ability and defensive investment to discourage attacks while still offering strong offensive ability. I personally get as much instant joy of seeing a couple failed attacks as I do from succeeding in defeating a hard base. I was surprised to see in-game weather effects. GT: When you win in PVP you get components. How are those used? Louis Castle: Components are used to promote a unit, which improves its primary ability; typically DPS or Health. Components are also used to build higher-powered units so players have the choice of improving their existing units or investing in entirely new units. GT: You’ve got a full Campaign in the game — What can you tell us about it? How long is it, do your resources transfer to the PvP Battle mode? Louis Castle: At launch there are two full single player campaigns in War Commander: Rogue Assault. Each has a story arc and most importantly, 20 or so missions that offer players the chance to try different units and tactics and to discover their favorite approaches to conquering bases. All resources and awards in the campaigns are immediately available to be used in base building and unit investment for use in the PvP matches. War Zones mode is global warfare. GT: What can you tell us about the War Zones mode? Louis Castle: War Commander: Rogue Assault offers a very innovated meta-game at the world map level. The War Zones allow players and their alliances to find and attack other players and alliances or non-player bases using Forward Operating Bases (FOBs) to enhance their attacks, defenses or tactics. War Zones extend the core game play loops to include rich strategies not often offered in sophisticated PC games, let along mobile strategy games. A frontal assault on a hardened structure isn’t a wise approach. GT: Anything else you want to share with our readers? Louis Castle: Just that we are super excited to be sharing War Commander: Rogue Assault with the world and we would love players’ feedback so we can continue to make the game better! PVP with the full HUD shown. 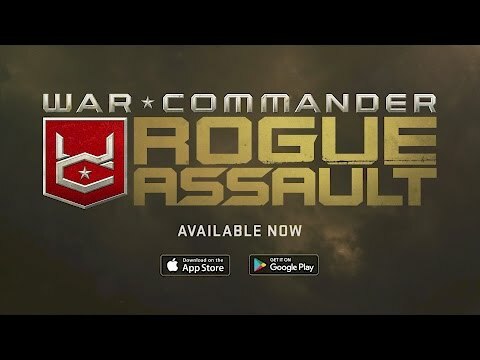 GT: On what platforms and when can players experience War Commander: Rogue Assault for themselves? Louis Castle: War Commander: Rogue Assault is launching worldwide in most countries and many languages on iOS and Android for phones and tablets. Players can freely play between Android and iOS. Jump in and try it for yourself. A big thanks to Louis Castle and the team at Kixeye for giving us a deeper look at War Commander: Rogue Assault. You can pick it up on Google Play and iOS app store right….NOW!